Thanks to Beer Week, we discovered Cervecería de Mateveza, a small Argentinian-fusion brewpub specializing in Mate-infused beers and empanadas nearby in the Castro neighborhood. We came for the beer floats made with their Salted Caramel mate beer and Bi-Rite Creamery's Salted Caramel ice cream -- but mysteriously word had gotten out and there was a run on the sea salt caramel. Their backup plan -- Mate Black Lager paired with Bi-Rite Vanilla Ice Cream -- was so perfect, it was hard to leave disappointed. Together they make a deliciously semi-sweet vanilla-scented frothy concoction with notes of effervescent chocolate on the tongue. 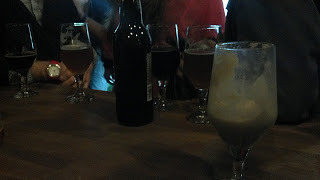 The ice cream portion was small so it wouldn't overwhelm the beer (this is a brewpub after all, not a creamery), yet the frothy head was the first and the last thing we tasted. 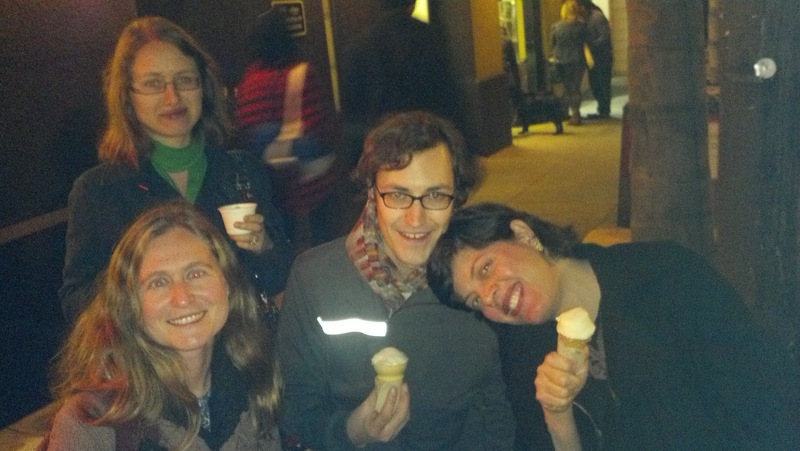 It was so tasty, our voracious group immediately headed straight to the source at Bi-Rite for the sea salt caramel ice cream - rated by US News and World Report as the third best ice cream in the country! Other amazing flavors we tried included cookies and cream (made with chunks of Newman's O's), coffee toffee, and chocolate with blood orange olive oil drizzled over top! !